These were the very first teachers who began to teach that a new dispensation was about to dawn and a new Manifestation was about to appear. They also taught that He would bring the entire world together under one banner. In 1844, the Bab (meaning, the Gate) announced to Mulla Husayn Bushrui, one of the followers of Sayyid Kazim Rashti, that He, the Bab, was a Manifestation of God,with shorter dispensation. He prophesised about coming of the Bahaullah through his words “He Whom God shall Manifest”.The Bab was thrown into the prison and moved to two different prisons during a short time. His followers were killed and tortured by the government. Finally, the Bab Himself was executed in the public square of Tabriz. Baha’u’llah (meaning, Glory of God) was a follower of the Bab. After the death of the Bab, Baha’u’llah in 1853 was thrown in to the Dark Pit of Tehran, and while imprisoned there, received the Revelation from God to start His Mission. After the release and banishment to Baghdad, Baha’u’llah went into a self-imposed exile into the mountains. The Babi community was more and more degenerated and leaderless. Even though the Bab had appointed a figurehead in Mirza Yahya, the half-brother of Baha’u’llah, the real leadership had always revolved around Him. Finally, the community sought Him out and begged Him to return. 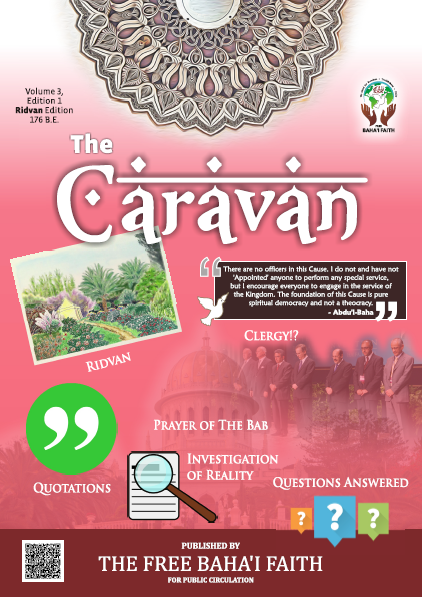 In 1863, Baha’u’llah publicly announced His assumption of the mantle of Prophethood in the Garden of Ridvan in Baghdad-Iraq, and declared Himself to be the Promised One of the Bab and all the world’s religions. After this, He was banished to Constantinople, then Adrianople, and finally to the Holy Land, and the prison city of Akka. There, he spent 35 years as a prisoner and wrote great volumes of His Scriptures for this dispensation. Towards the end of his life, he was made a prisoner under house arrest in mansion of Bahji. There He passed away in the year 1892. Abdu’l Baha was appointed by Baha’u’llah in His own lifetime, to be the appointed interpreter of the Writings and the Centre of His Covenant. To Him all the Baha’is turn for guidance and remain united. The Master accepted His father’s Prophethood at the age of 9 years and also spent a part of His life imprisoned with Baha’u’llah. With the Young Turk Revolution Abdu’l Baha was freed, and in 1912 He went on a worldwide teaching trip to Europe and America with Mirza Ahmad Sohrab, his secretary and interpreter. He passed away in the year 1921. Lady Ruth White was the first inspiration of the Free Baha’i faith. Ruth White and Hermann Zimmer both spent their entire life serving the Cause and in spreading the true teachings of Baha’u’llah and Abdu’l Baha. Ruth White along with the New History Society members, Mirza Ahmed Sohrab, the secretary and interpreter of Master Abdu’l Baha, Lewis and Julia Chanler worked towards spreading the faith in the United States and its surrounding countries. Hermann along with Dr. Herrigel, a founding member of the German Baha’i community, was more engrossed towards working for the faith in Germany . They taught people, the words of Bahaullah and Master Abdul Baha. However, Shoghi Effendi kept close watch on the activities of the New History Society.Fearing the increasing popularity and increase in the number of members, he gradually excommunicated the founders of New History Society. He also filed a suite against the members of New History Society trying to patent the word “Baha’i”. And by good fortune the so-called Guardian lost the case. Lady Ruth, since coming from a Christian background, went all out to preach about the Baha’i faith to popular Christians of her time. While working for the cause she even met Mehar Baba and his disciples, but unfortunately her life did not support her and while into the movement she left for the final abode. Lady Ruth and Hermann Zimmer through divine guidance came to the conclusion that the position of Guardianship which Shoghi Effendi, grandson of Abdu’l Baha, claimed for himself was based on a fraudulent Will of Abdu’l Baha. Shoghi Effendi changed world’s most unpolitical religion into a political religion, ignoring the sayings of Abdu’l-Baha that “This religion could not be compressed into an Organisation. Shoghi built up an administration where the spirit of the Religion of Baha’u’llah and Abdu’l-Baha was completely missing. He became for himself a world dictator and a power hungry person who excommunicated all the members of the Abdu’l Baha’s family including his own parents. He abrogated the most important principle of the Baha’i Faith “Independent investigation of the Truth” and called the followers of the Baha’i Faith as “Harmful Elements”, as “Enemies” or as “Crazy”.After the death of Shoghi Effendi,the reigns of the faith were taken over by so called Hands of the Cause,they further formed Universal House of Justice for the purpose of administration of the Baha’is world wide.Thus,the actual essence of the Faith was lost,and it remained a mere administrative organization. The promised one of the Baha’u’llah will appear after a thousand/s of years. This is the Covenant which Baha’u’llah made. In case of differences, Abdu’l Baha must be consulted until the Universal House of Justice is established, to ward off all differences. Today the Free Baha’is are residing in different parts of the world. They can be found in countries like Bangladesh, Emirates, Germany, India, Iran, Israel, Russia, Singapore, Sri Lanka, Thailand and USA. Although few in numbers, they are busy carrying out the true teachings of Baha’u’llah and Abdu’l Baha, hoping that one day the true ‘House of Justice’ will be formed, which will ward off all differences.